Snap on Sunday this week comes to you from glorious Penzance with a couple of increasingly rare types in this day in age. First up are two of First Kernow's surviving Varios (are these the only two now? ), S526 RWP and S554 RWP. The Mercedes minibus continues to decline ever further in a majority of the UK, but Cornwall is most definitely the exception, with numbers in use still very high. It's hard to argue that anything is more suitable for the narrow twisting lanes of the county, and with the price of the smallest of Optare Solos still being relatively high it's understandable that many operators are keeping their Mercs going for as long as possible. Come the end of the year though, buses under 7.5tonnes will be required to meet DDA unless they have a suitable wheelchair lift, or are COIFed at 22 seats or under. It is quite possible therefore that some operators may choose to decrease the capacity of their Mercedes on their lightly used routes, so that these can continue to operate. It almost seems the wrong way round when you consider the smallest of buses are having to be withdrawn first under DDA, with the deckers going last (excluding coaches). Although of course the double deckers have a higher initial value, the deckers are far more likely to pay their way, with them most often being used on routes which have high ridership. I know this is somewhat of a generalisation, but the principle stands. The mini/midi buses however are there for the routes of generally low patronage, and therefore profit margins are lower; again, this stands to reason. So the number of years it takes for them to pay for themselves in general is likely to be higher than that of a decker. It therefore seems pretty unfair on these small operators in such places as Cornwall who struggle to turn a profit as it is, to then have to be the first to get rid of what could be seen as perfectly useable and reliable vehicles, before that of the larger companies running deckers, reaping in the cash. Food for thought maybe! Anyway, talking of deckers, amazingly, the K-LAE duo are STILL at work in Cornwall. A stop gap they appear to no longer be, and K615 and K629 LAE continue to ply their trade throughout the county. Unfortunately I really wasn't expecting to see K615 thrash out of Penzance Bus Station, and hence the shot is fairly poor - but better than nothing I thought! With an afternoon spare earlier this week I decided to pop into Plymouth to sample some of the new offerings within the city, taking advantage of the new 'Skipper' ticket. For those of you that haven't heard about this, there has (at last!) been a new multi-operator ticket introduced for Plymouth, covering all operators including First, PCB, Western Greyhound, Target Travel and Jackett's Coaches; I just wish it had been introduced earlier, could have saved me untold amounts of money over the years! At a reasonable £4 it's a fair amount cheaper than buying the two main operators day tickets, and of course has the added advantage of including the 'deeper' urban routes which may encourage some extra patronage on these. Anyway on with my short review! I must point out that these are purely observational and are by no means an accurate representation of how the routes are doing as a whole. This is exacerbated by the fact that this was during a period many people were still off work, with possibly slightly more people than normal journeying into the city centre off peak for the January sales, so take these with a pinch of salt! The first route I had a go on was First's 83, with the '12 reg Enviros now the norm on this route in response to Plymouth Citybus' Blue Flash. The service had pretty reasonable loadings considering this was a morning outbound trip, but there was certainly several that decided to hang on for the Blue Flash, and even a few passengers that tried to get on the First service before being told they had a Plymouth Citybus ticket! Undoubtedly these were the people that just got on whatever came along first. 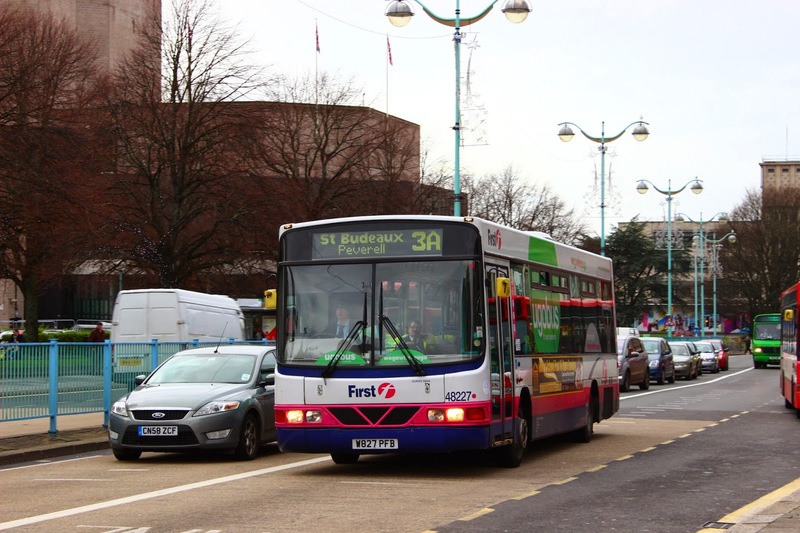 First offer double the number of journeys during the day, as well as operating slightly earlier, and substantially later than Plymouth Citybus' Blue Flash, with First's services running either 5 minutes in front or 5 minutes behind (or 10 minutes in front) of PCB's. Heading back I journeyed with PCB and again, loadings were fairly good, they certainly appear to be steadily picking up, and talking to the driver, things are looking encouraging. A couple of my relatives recently traveled on the Blue Flash initially unaware of this new service, but were certainly very impressed with the quality of vehicle, with him describing it to me as "The Pullman buses"! I then headed for Torpoint; a corridor I've grown to know very well over the years. Right from the off I was surprised that Plymouth Citybus were risking this route, as there are most definitely extra operational challenges with operating across to Torpoint, along with the very loyal passengers that First have been carrying for many years. PCB was met with quite a frosty reception from Torpoint from the off, as the introduction of the 32 timed in with one of the three ferries being away for refit - reducing capacity substantially during this period. This meant that often, two First services would end up on the same ferry because the ferry can't sustain the normal timetable with 2 ferries, and with a 3rd bus chucked in as well in bright red, people were quick to criticise them, particularly seeing as all three would still be receiving priority boarding. Quite obviously, there isn't the demand to fill 3 double deckers, with some 265 seats on offer, and hence the public seeing 3 deckers with low load factors travelling together was understandably frustrating. On the few trips I have now done, several months into the 32's operation, loadings are still very poor. On a number I have been the only person aboard the vehicle for most of the journey, although inbound morning journeys do collect a number of passengers whilst going through Stoke; an area no longer served by First. 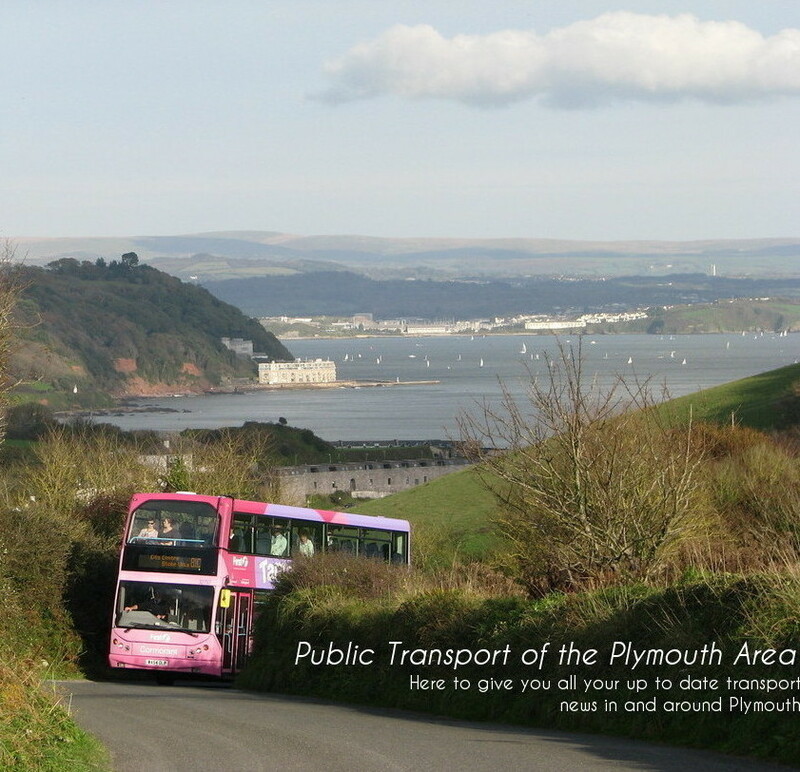 As afore mentioned, Torpoint's residents are a loyal bunch, with them having built up strong relationships with the drivers at Torpoint over many years. 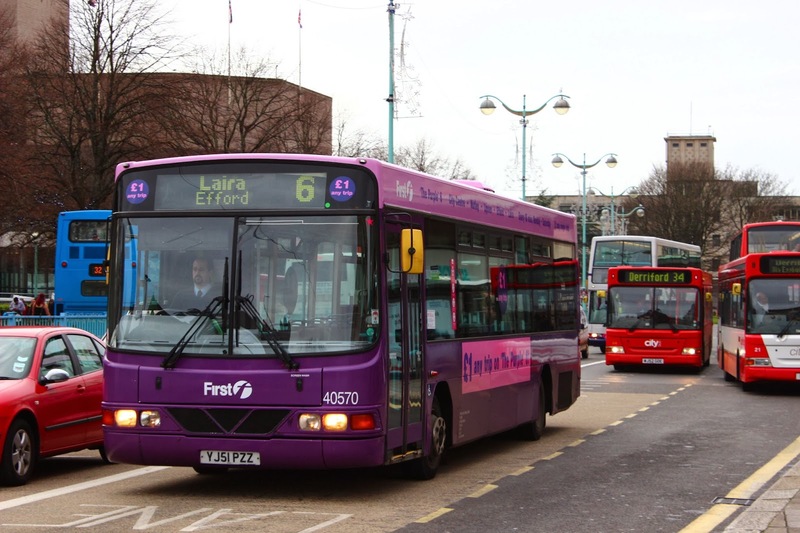 Having their own local depot, with only around 20 drivers allocated to service has meant the drivers have got to know their passengers well, with many of them having worked out of the depot for a substantial amount of time. This has meant that they haven't wanted to let them down when it matters, and indeed, very few appear to have made the switch. I'd presume Plymouth Citybus are now holding out until the tender for the Torpoint stage carriage and school work comes up for renewal in the very near future, where they may be able to get a decent foothold from which to build on, but for now, First certainly appear to be ruling the roost. Purple 6 was the next route I sampled, aboard one of the shoddily branded Ex-Tavylinx Volvo B6BLEs. Loadings seemed fairly good, but as has been commented, they need to be good to even have a chance of breaking even. Running at £1 per person means the load factor has to be high for them to even start to make a profit, and although there were around 15 other people joining me on both the inbound and outbound journeys, these loadings would need to be consistent on every trip. It's a brave effort, and it certainly hasn't been a total flop, but neither has it completely decimated the competition like First were quite possibly hoping. The surprise of the day was actually service 3A though, the new extension of the 3 through West Park, Honicknowle and Peverell. 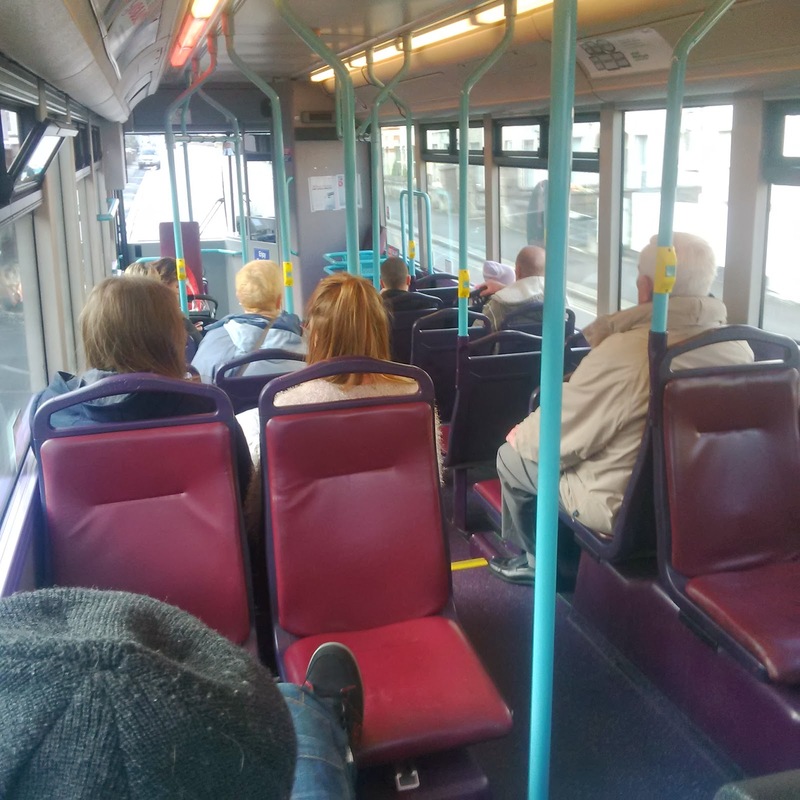 I boarded on a mid afternoon trip at around 1530-1600 expecting loadings to be very light at that time of the day, on a route I presumed would have been quiet anyway, but I was pleasantly surprised by the numbers using the service. Few boarded through West Park, but once into Honicknowle fairly substantial numbers boarded the service, many of which were paying cash fares, with actually very very few being OAPs. By the time we'd gone through Peverell the Dart was carrying a good load of around 25 passengers which I certainly thought was very good for the time of day and direction of travel. This may have been an anomaly as I have only done one trip on the 3A, but if other journeys are carrying in the same vein as this one, then First appear to have made a really good decision pulling out of Barne Barton; an area which had really dried up for them. Some photos come, courtesy of Kameron Allan at www.swtransportnews.blogspot.com, with many thanks from me.